Chronic renal diseases are disorders that affect your kidneys. These genitourinary diseases can prevent the kidneys from functioning properly, leading to health complications. Due to the severity of some renal diseases, the Social Security Administration and other long-term disability insurance providers can help you during this difficult time with long-term disability coverage. If you suffer from nephritic syndrome, nephritis, or another form of kidney disease, we understand that it can be impossible to work for the wages you need to pay your medical bills and other expenses. However, an experienced disability attorney may be able to help you get the long-term disability benefits you need. For more information regarding long-term disability filing, contact an experienced Indiana long-term disability attorney from Hankey Law Office, today at (800) 520-3633. The kidneys are two bean-shaped organs that are each roughly the size of a computer mouse. As your body metabolizes food products, it creates waste like urea and creatinine. The kidneys filter these products, toxins, and other waste from the blood and eliminate them via urine. Additionally, your kidneys help you balance the levels of water, salt, and electrolytes in your body, among many other important tasks. Chronic renal disease can force patients to rely on dialysis treatments to filter your blood. In some cases, they may even need a kidney transplant in order to survive. 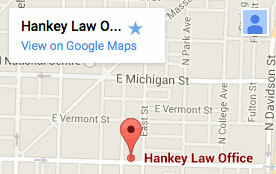 At Hankey Law Office, we understand that treatment for your kidney disorder can take over your life—and your finances. If you are facing a chronic renal disease and require long-term disability payments, contact a determined Indiana long-term disability lawyer from Hankey Law Office, at (800) 520-3633 today.